I recently learned about the fanciful artist and architect, Friedensreich Hundertwasser and his various creations like the Green Citadel. I also learned that he took part in Luna Luna Park in Hamburg, Germany back in 1986. 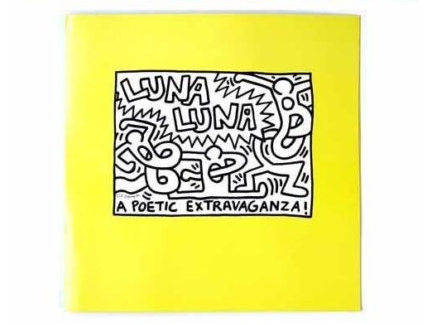 Luna Luna was the brainchild of the equally interesting Andre Heller and was a traveling combination of a contemporary art park and a “child’s dream” of an amusement park. Heller invited famous artists of different generations to participate. Salvador Dali, Jean Tinguely, Jim Whiting and Roy Lichtenstein created special installations. Younger Americans Jean-Michel Basquiat, Keith Haring, and Kenny Scharf, along with several German neo-expressionist painters decorated children’s rides. Seeing Haring listed here reminded me of a special pop-up. 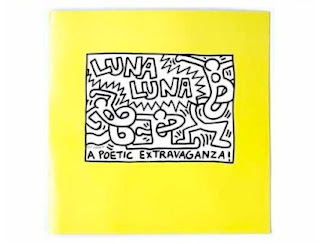 Of interest to us today is the pop-up folio that celebrates the colorful carousel created by Keith Haring for Luna Luna. This 12” x 12” single spread pop-up was paper engineered by Ron van der Meer and produced in 1986 by Carvajal in Columbia. The edition is rumored to be around 2000 so this pop-up is a rare breed to come across. Equally scare is information on Luna Luna Park and it’s success. 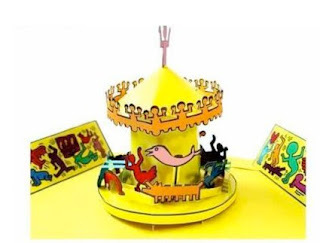 Nonetheless, I would have loved to visit this avant-garde carnival and hope that one day I can at the very least own a pop-up artifact from this bizarre wonderland.